Steam Dozer Willy was content with his life of digging and dozing... until the day the zombie apocalypse came and turned his whole world upside down! What a drag... all these zombies lumbering around his dig site! 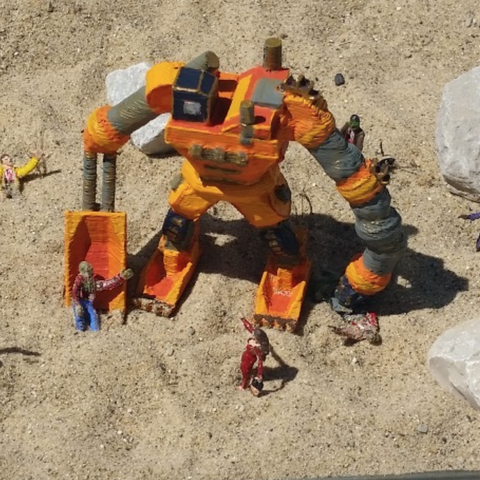 So, Willy did what any autonomous construction robot would do. DESTROY ALL HUMANS!!! Wait a minute... all the humans are gone? Oh well, guess all these zombies will have to do until civilization makes a come back. Time to get smashing! As a side note: This model was created using Vectary. For some reason when I export it from their website it comes out hollow and falls apart when I try to print. So, I ran it through MexMisher to "solidify" it but it jumped the file size up from 500kb to 18MB. If you can solidify it yourself without making the file size so huge then download the normal Willy file. If you don't want to mess with it then download the Willy edited file.